This answer discusses the three methods that the Falcon 9 1st stage uses for attitude control during re-entry and landing. They are: cold nitrogen jets, "hypersonic" grid fins, and thrust vectoring of the engines. 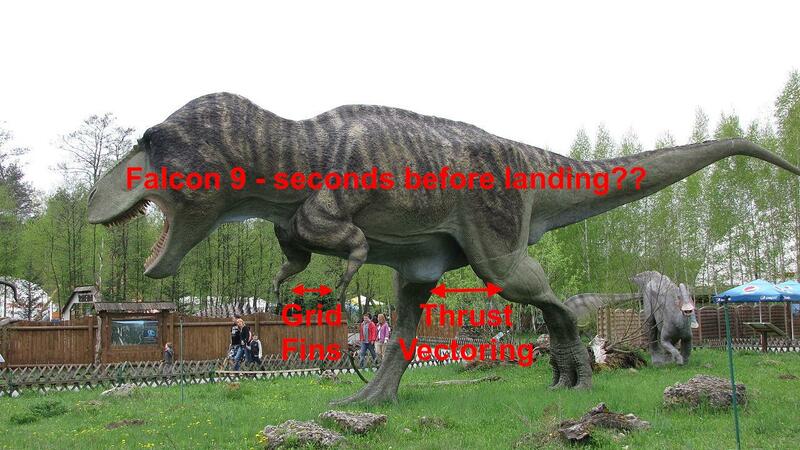 It is pointed out there that the grid fins are moving even in the last seconds of landing. I suggested that like the front arms of the Tyrannosaurus Rex - they may move when it moves, but that doesn't mean that they are necessarily doing anything useful. What is the function of the hypersonic grid fins on SpaceX's booster? Did CRS-6 landing fail because the steering fins are ineffective at low speed? 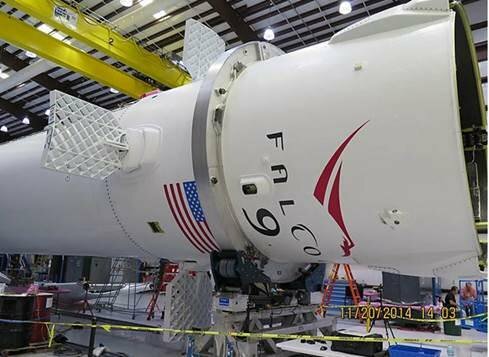 In this Tweet and image, Elon Musk calls them "hypersonic grid fins". My question is How effective are Falcon 9 1st stage grid fins in the last few seconds before landing? I'm looking for something quantitative, and with some kind of supporting information, rather than opinions. Thanks! The speeds are at most a few hundred kph and of course down to zero. My feeling is that since they are actually pretty small and mostly holes, at these speeds they are not significantly effective, but they keep moving anyway because it is simply safer to not have anything in the control code that turns them off, thereby reducing one possible failure mode. I also believe that in the last few seconds before landing, where velocity is low and fast attitude correction time is crucial, only thrust vectoring is useful for attitude control of the Falcon 9 1st stage. The grid fins are a critical control surface to the returning Falcon 9 first stage, but are only useful during certain parts of the flight after the second-stage has separated. The grid fins provide virtually none of the control authority to the descending stage in the final seconds of the landing process, once the "landing burn" has started. With the landing burn in operation, the rocket has considerable control authority (directional pointing, as well as descent velocity reduction) from the gimbaling mechanism on the rocket engine(s). out-of-the-atmosphere, during the initial minute or so of post-separation flight: the grid fins are useless, as there is insufficient atmospheric mass for them to interact with. atmospheric entry, as the descent continues and the very beginning of the "thicker" atmosphere is encountered. Grid fins are possibly of some benefit, but limited by the still remarkably thin upper atmosphere. encountering the denser atmosphere, this is where the stage surfaces would begin to heat excessively, sufficient to cause damage if unaddressed. SpaceX novel approach is to fire three of the nine first-stage engines to "retropropulsively" reenter the atmosphere. Much control authority is available to the descending stage from the gimbaling rocket engines. The grid fins are unneeded in this phase of the descent. high-altitude, high-velocity supersonic descent Grid fins operate well in the supersonic flight regime, and are very useful here, as well as the only method the rocket has for control authority at this point. transonic flight. This is where the rocket transitions from supersonic to subsonic velocity (simply due to the atmospheric drag that is continually slowing the descending stage), and encounters a great deal of "transonic buffet", where part of the rocket's surfaces are in supersonic flow while other parts are encountering subsonic flow. Grid fins are generally quite ineffective in the transonic regime. subsonic descent. Once the rocket stage is below about Mach 0.9 to Mach 0.8 velocity, the grid fins are once again very useful and the only control surfaces available to help "point" the rocket until the landing burn is initiated. The rocket continues to decelerate initially due to atmospheric drag, up until the time that the force of gravity on the descending stage is equal to the force of drag on the stage; at this point, the stage reaches what is called "terminal velocity." The grid fins are useful during all of this. landing burn firing: grid fin value quickly falls as the velocity rapidly decreases from the several hundred kilometers per hour of terminal velocity to less than a few meters per second. Grid fin effectiveness is a function of velocity of the airstream, so grid fins really do little or nothing in the final few seconds of the descent and landing. Not the answer you're looking for? Browse other questions tagged spacex falcon-9 landing supersonic or ask your own question. 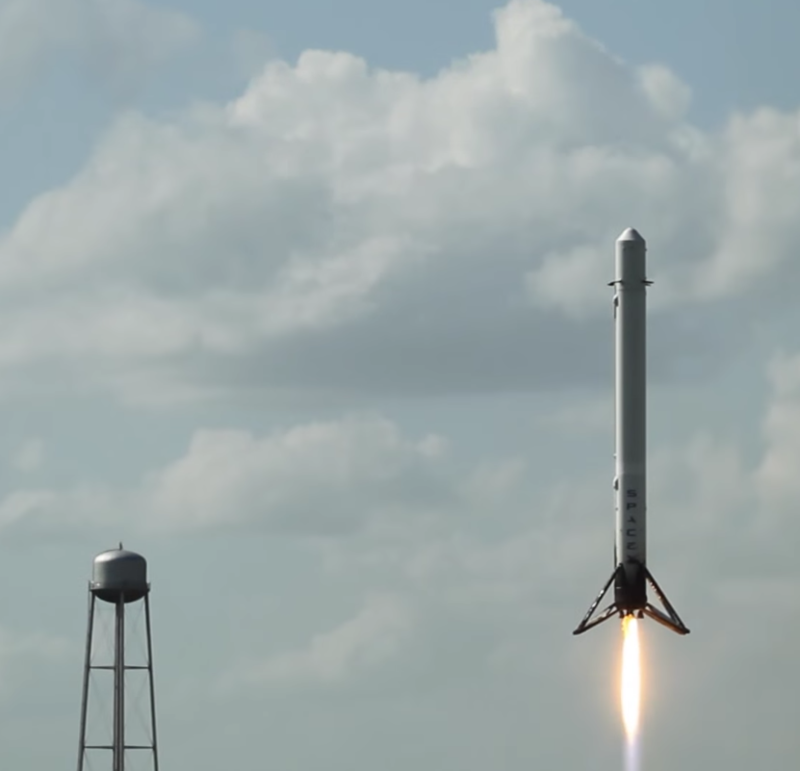 How does the SpaceX Falcon 9 first-stage straighten for landing? 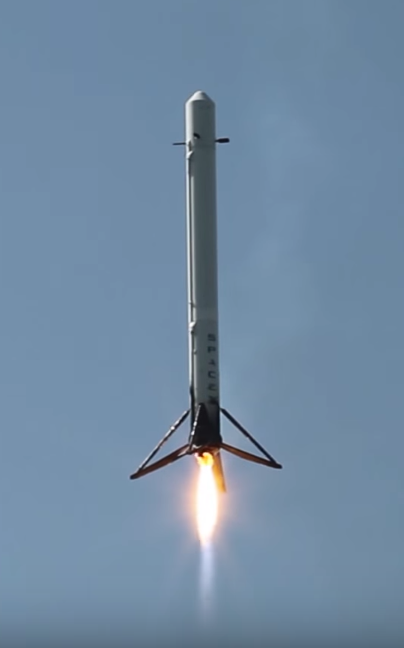 What do the Teeth on the SpaceX Falcon Mod4 do? Why does the Falcon 9 consume hydraulic fluid? Is SpaceX grid fin material flammable? From which direction was the Falcon 9 1st stage's landing approach (BulgariaSat-1)? How do the F9 grid fins extend and rotate? Can SpaceX Falcon 1st stage hover during landing?